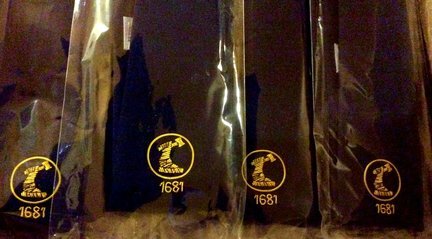 NOW IN STOCK: AVAILABLE TO MEMBERS, NEW IMPROVED TIES £17.00 EACH! £840.00 raised at 2017 Annual Common Riding Foy for local charity. ​Congratulations to Shane Miller, winner of the Hammermen Medal for technical subjects 2017. Well done from all the committee, members and friends of the Incorporation! 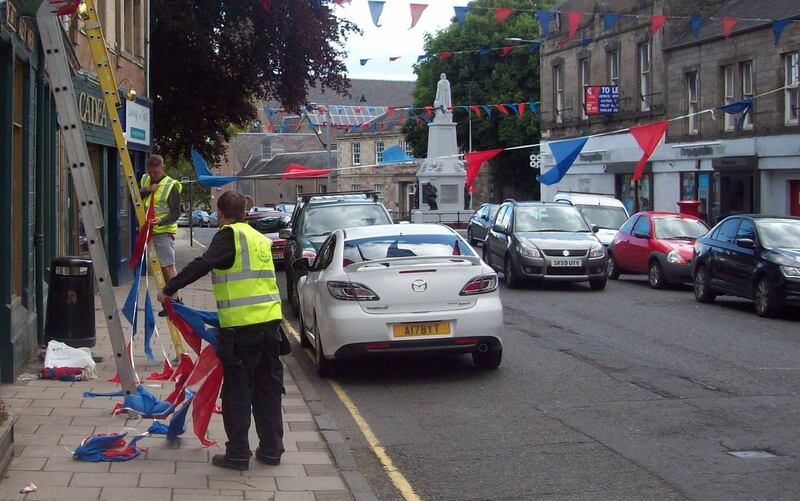 Hammermen Committee, Members and Friends decorate town in preparation for Common Riding 2017. 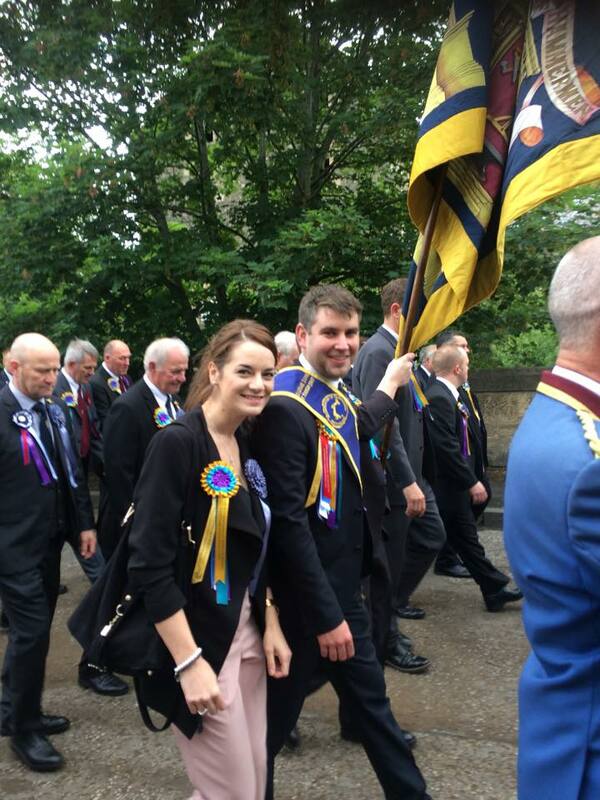 There was a busy morning for the Hammermen committee, members and friends decorating the Royal and Ancient Burgh in preparation for the Common Riding on Sunday 4th June. Special thanks to Billy and Ryan Dow for their service over many years and for 'showing us the ropes' and to Office Specialties for their kind support in supplying our Hi Viz Vests. 24th March 2017. £500 donated by the members and guests at the Annual Common Riding Foy was used by the Play Park Committee to purchase sand for 'soft landing' areas in the park. Members of the Hammermen are seen helping committee members to spread the sand around the facility. 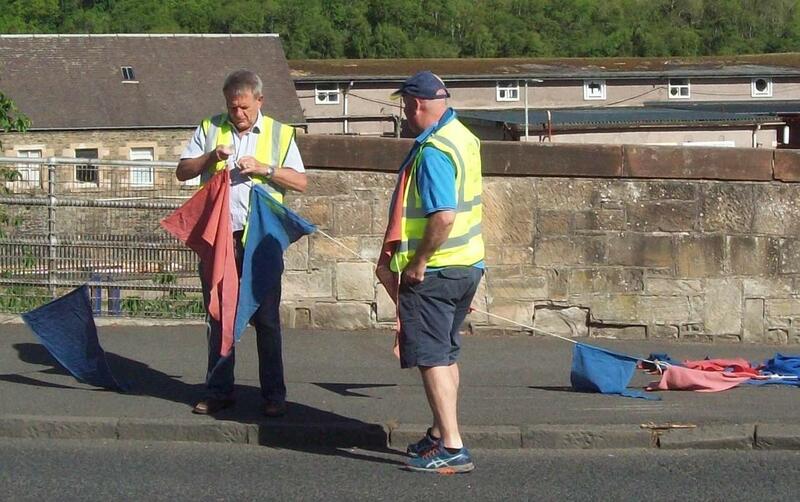 ​An additional £500 has been donated to the 'Young Souters' for polo shirts. Congratulations to Caleb Gibb, winner of the Incorporation of Hammermen Medal for Technical Subjects 2016. ​Could this be a first? 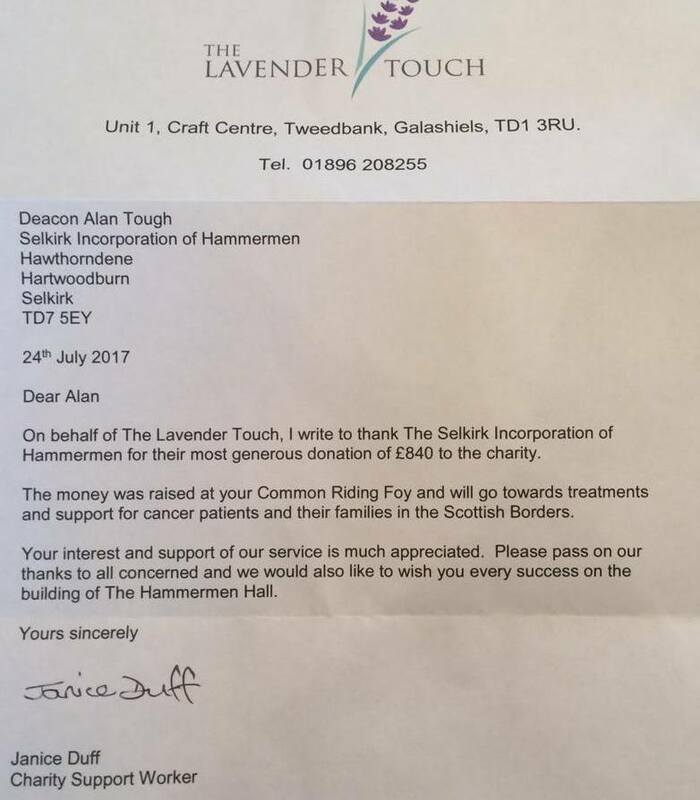 ​This year the Selkirk Incorporation of Hammermen will celebrate Platinum, Diamond, Golden and Silver Jubilee Standard Bearers and Lady Bussers. ​From the top left clockwise: Stuart Russell & Mrs Kathleen Thomson (1946), John Rathie & Ms Justine Lawton (1956), Jock Craig & Mrs Anne Cochrane (1966) and Billy Birse & Ms Joyce Birse (1991). Self-employed electrician, Graeme Legge was elected Hammermen Standard Bearer 2016 at the Incorporations AGM on April 12th. He has chosen Royal Blue as his colour. ​Very best wishes to him and his Lady Busser Sarah Legge from everyone associated with the Hammermen. We are delighted to announce Connor Gray has been awarded the Hammermen Medal for Technical Education for the Session 2014/2015. Well done Connor! Your generosity will help give comfort to local cancer sufferers and their families allowing many to be treated at home during the final stages of their illness. The tradition of raising money on our special day was initiated by the then Clerk, Rodney Pow to mark the year 2000 when the initial collection was used to sponsor the education of two boys, one from Cambodia and the other from Zambia. 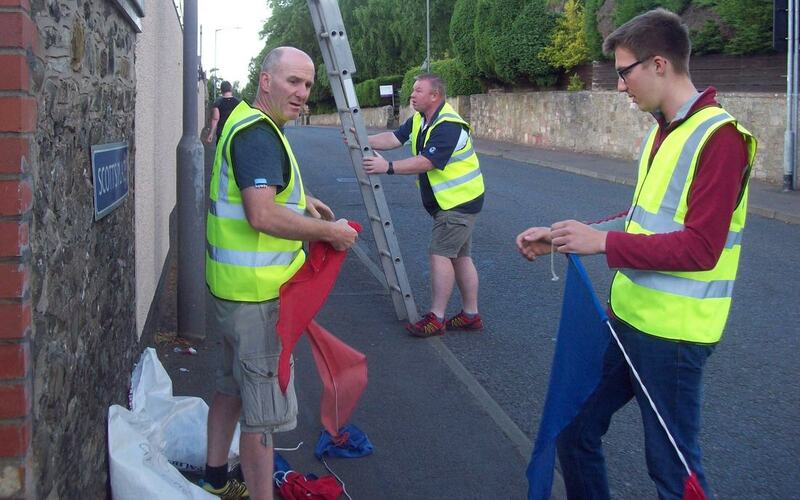 Subsequently the Foy has supported a variety of projects including providing equipment for the local bands, sponsoring youth rugby and the construction of a new play park in the town. 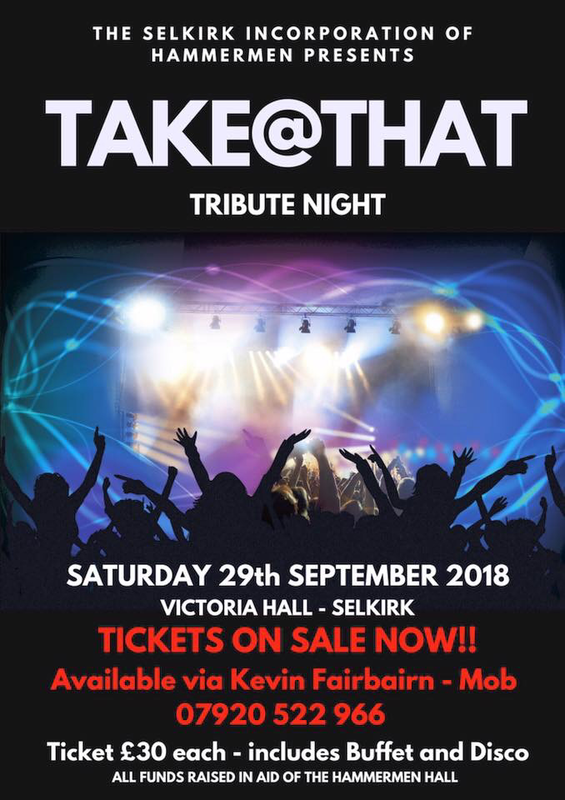 As an organisation we are committed to on-going community engagement, but this can only be delivered by the continued support of our membership and their guests and for this we are extremely grateful. 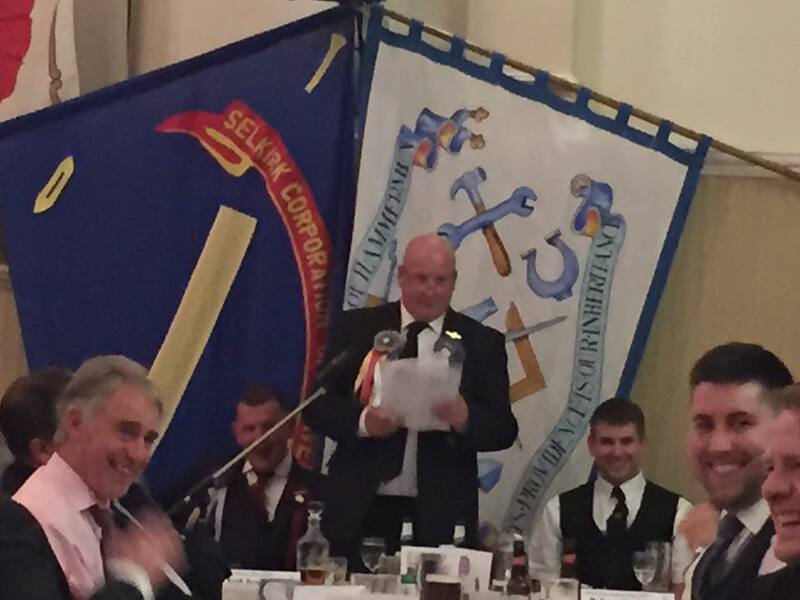 The AGM of the Selkirk Incorporation of Hammermen was held in the County Hotel on Tuesday 14th of April. Deacon: Kevin Fairbairn, Colleague: Tommy Knox, Clerk: Alan Heatlie, Boxmaster: Bruce Hastie, Officer: Cameron Cochrane, Quartermasters: Nigel Maltman, Duncan MacDougall, Jason Hendrie, Alan Wheelans, Darren Munro, Keiran Riddell, David Main. Life Members: Campbell Bunyan, Jim Newlands, Common Riding Executive Committee: Rodney Pow, Common Riding Trust: Les Millar. 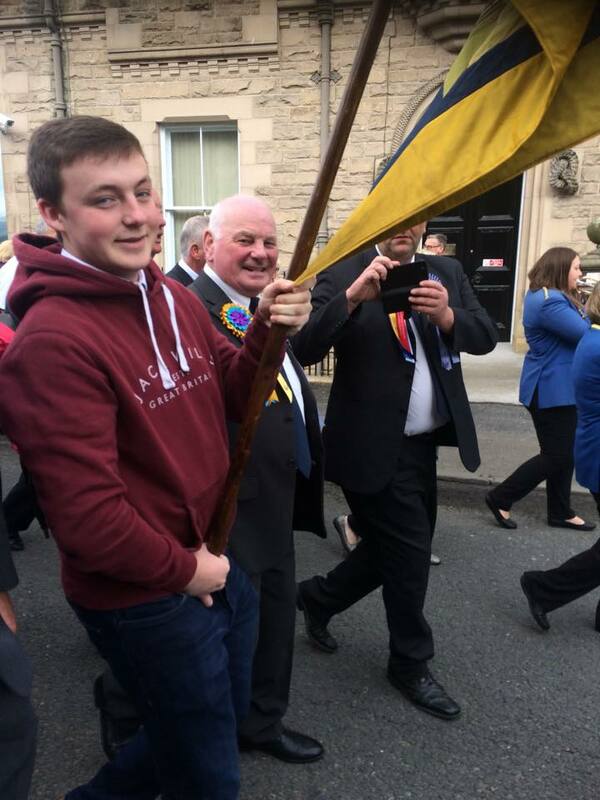 The most significant election of the night was that of Standard Bearer for 2015 which saw Michael Glendinning unanimously elected to the post. The Incorporation are delighted with his election and wish him a happy and successful Common Riding. Congratulations was also given to Billy Greig our 60th Anniversary Standard Bearer, Iain Hill celebrating 50 years since carrying out his duties as Standard Bearer and Nigel Maltman who celebrates his 25th year. 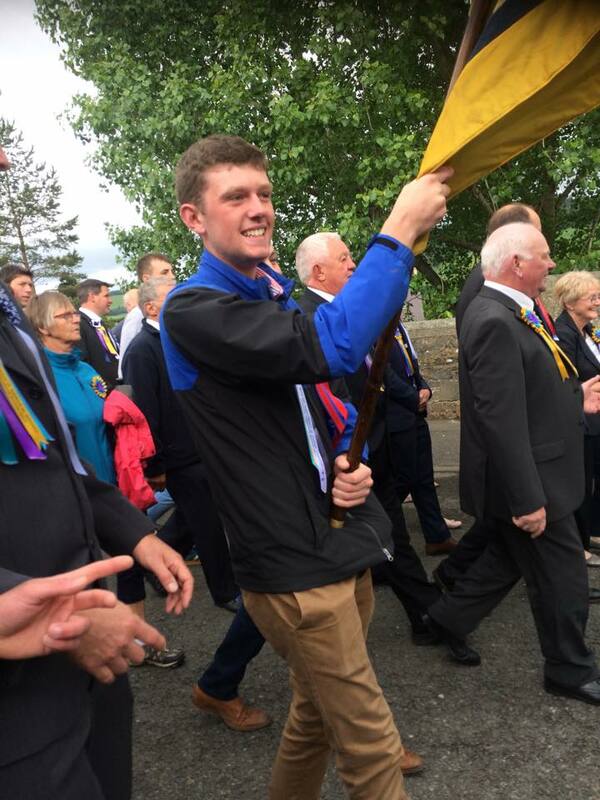 Standard-bearer Glendinning has confirmed that his sister Sandie will buss his flag and that his ribbon colour will be cornflower blue. 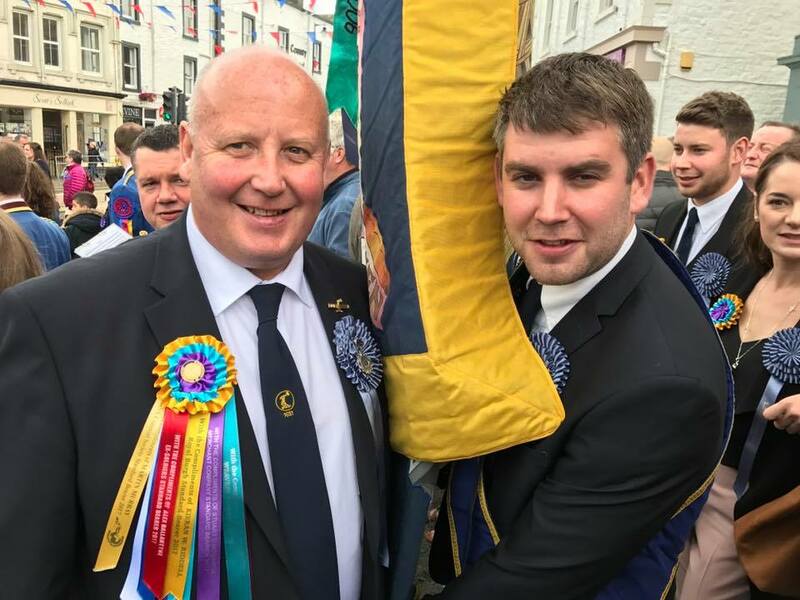 Deacon Kevin Fairbairn and 2014 Standard Bearer David Main visited the Band Hall to hand over a cheque earlier this month to the Selkirk Junior Band along with other Common Riding Associations. 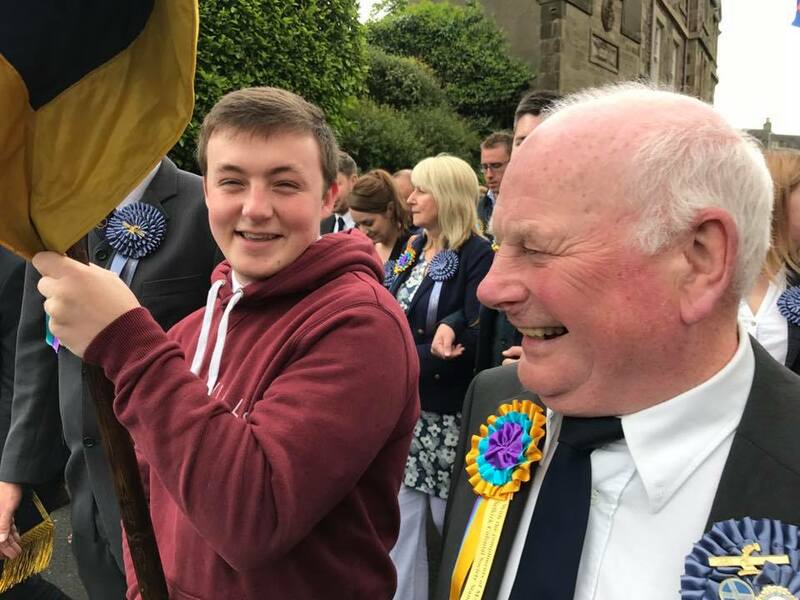 It has been a tradition over the last few years to have a collection during the Common Riding Foy for a cause (or causes) selected by the Deacon. In the past the craft has funded a diverse range of schemes including: education programmes in Africa, shirt sponsorship for local youth rugby and contributing to local play park schemes. 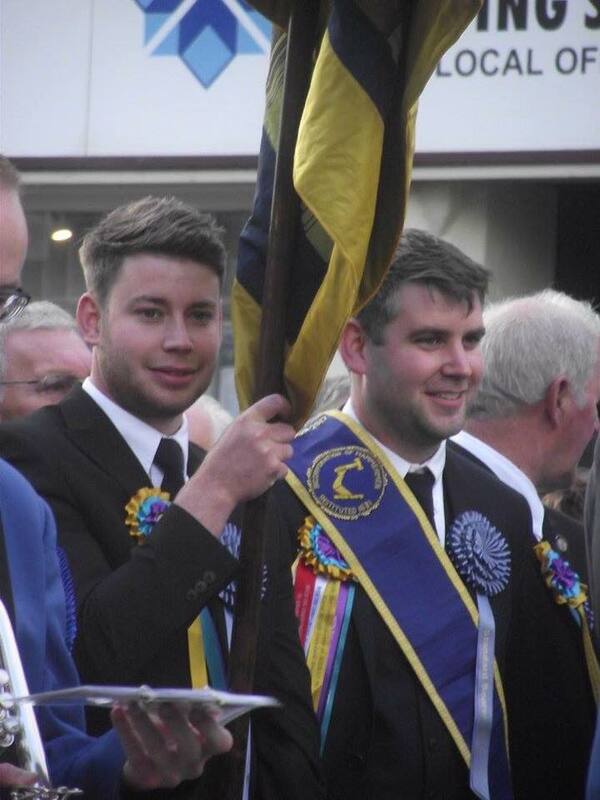 This year part of the collection was allocated to providing an instrument for the Junior band, an integral part of Selkirk Common Riding.